Outsource2india (O2I) is one of the leading providers of video transcription services. With more than 20 years of experience in video transcription, we have successfully provided high-quality video transcription services for business organizations, schools, media, universities, law firms, and art institutes amongst others. Language customization professionals and producers have also benefited from our accurate audio video transcription services. Our clients have greatly benefited from our fast, reliable, and efficient video transcription services. With outstanding infrastructure and an experienced transcription team, O2I is the perfect outsourcing partner if you are looking for professionals who understand your project requirements and offer services based on your needs in a cost-effective and timely manner. We understand that outsourcing your services can be quite risky. We guarantee confidentiality and adhere to all the guidelines and quality processes outlined in the Service Level Agreements (SLAs). 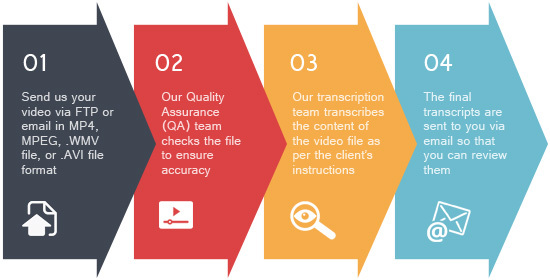 Since accuracy is quite important in transcription, our Quality Assurance (QA) team ensures that all transcripts have an accuracy level of minimum 96%. Apart from general video transcription services, we also provide VOX POPS transcription. Outsource your video transcription requirements to us and avail our services at affordable prices. Our pricing structure is specially designed to suit your budget. Send us your query by filing out our "Contact Us" form and our team will get in touch with you within the next 24 working hours.